Any business knows that first impressions can make or break you when it comes to attracting new clients. So when Hoflehner Interiors commissioned Michael Prohaska of brenn-punkt, Architects of Fire, to work HIS magic on one of HOFLEHNER’S showrooms, all involved knew the design had to make a visual impact. Their Showroom in Linz, Austria, has now been transformed by the addition of two EcoSmart burners, which Michael selected not only for their aesthetics, but for practical reasons too. 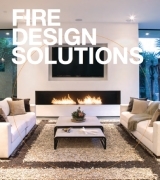 “First and foremost our client wanted a timeless, clean design using fire as a central piece in the space,” explains Michael. “It also needed to be clean burning, with no soot, smoke or ash to be released into the air in the showroom. Hoflehner Interiors prides themselves on their overall aesthetics planning. Their philosophy states that every detail in a space contributes to the total mood and style of the room. So, taking a leaf out of their book, considering all other items in the showroom space before designing a suitable fireplace was a priority for Michael. 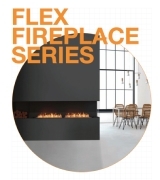 “The fire is for aesthetic reasons only – the whole design of the EcoSmart burner is very smooth and sleek, and we paired it with tiles and other modern smooth textures to fit with the feel of the client’s showroom,” says Michael. “The clean and even design works perfectly within the space. Also, the big variety of burner sizes and models gave us a lot of choice. 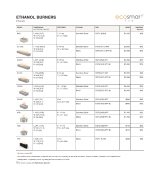 When we were working the design of the fireplace into the space, it helped so much that the EcoSmart website provides all of the relevant planning data, 3D data and CAD files. 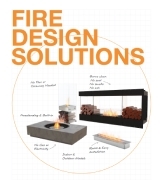 Michael and the team at brenn-punkt, Architects of Fire, have used EcoSmart fires several times before, and are now working exclusively with the brand on future projects. They currently have a vision to install EcoSmart in a hotel or restaurant. Industrial Panache From a formal dining space full of luxurious fabrics and elegant furnishings, to a casual eatery featuring industrial detail like steel and moody colours – Cristina Hofman from At Home Interiors truly transformed this waterfront restaurant. Focal Points Junction Moama, a restaurant and dining space located on South Australia’s Murray River, prides itself on using local produce to create superb food, wine, cocktails and craft beer, and providing a stylish venue for friends and family to gather to enjoy these specialties. Theatrical Elements When you think of theatre, what comes to mind? Drama, glamour, music and movement – these are just some theatrical elements the award-winning Simeone Deary Design Group captured in their redesign of the boutique Allegro Hotel in the heart of downtown Chicago. RAW Design An “opulent New York loft with raw aesthetics and industrial elements” – this is the vision renowned Australian hair stylist Anthony Nader had for his refurbished salon in the trendy inner Sydney suburb of Surry Hills. Ribbon of Fire How do you bring a sense of warmth and ambience to a living room built of concrete, steel and glass while maintaining a sense of continuity with the home’s design? Gathering Place Fire is synonymous with celebration; it comes in the form of softly flickering candles at a formal dinner, a warm, crackling fireplace at a family gathering, or even the spark that sends fireworks shooting into the sky on New Year’s. Urban Retreat Hidden in the depths of the huge and bustling city of Hong Kong, there is a family of four who are comfortably relaxing in a homely retreat which gives them a sense of peace amongst the chaos. Powerful Partnership Revered in the Unites States as the first company to create furniture for full-time outdoor use, Brown Jordan is known for distinctive silhouettes that enhance “traditional, transitional and contemporary environments. Bohemian Chic A focal point for a bohemian chic penthouse and a great accent to a modern bachelor’s apartment; Kara Smith from Smith and Firestone Associates Luxury Interior Design may have been looking for two completely different missing pieces when designing two suites for the Residences at W Hollywood, but she found one common solution.